WARNING: Today’s post has some math. Call me a nerd, but the bean counter in me likes to evaluate even the tiniest of decisions to see whether or not they’re really worth the pay off. I know some people aren’t as fond of numbers as I am, so it’s my pleasure to do it on their behalf as well. Saving money on cheese was no where on my radar until about six months ago. At the time, I realized we were buying more protein-rich foods – other than meat – in an effort to still consume enough protein, minus the expense. There was a sneaking suspicion dinging around in my brain that buying whole bricks of cheese would be more affordable than buying shredded, sliced, string or even those little snack-y cheeses, but I never really sat down to do the math to see how much money I could be saving. Nor did I weigh the pros and cons to doing some of the prep work myself. 9 times out of 10, it’s cheaper to buy bricks of cheese. Argue with me all you want that buying shredded can save you time, or that buying string cheese helps you better with portion control and thus saves more in the long run. Go ahead – I’m open to hearing your side of the story. But I’m warning you, it’s going to be tough to convince me otherwise. I spent WAY more time than I had available typing up all my calculations and comparing notes just to try to convince you that buying bricks is the way to go. Crunch the numbers the next time you shop. Here’s my case: a 2 lb brick of organic cheese at Costco costs 34¢ per ounce. Organic sliced cheese costs the same per ounce, but have you ever tried to shred sliced cheese? Nearly impossible unless you want shredded fingertips too. Which means you’ll have to buy shredded cheese too… and you’ve now doubled your cost. Note – I wouldn’t recommend cutting sliced cheese in an effort to “sprinkle” cheese onto something. You end up with chunks, not shreds, and chunks don’t sprinkle well. Organic string cheese is considerably marked up at 42¢ per ounce, and I’ve only seen one flavor available in organic: mozzarella. I have seen a colby/jack combination in conventional, but the colby is orange. I’m willing to bet it’s colored with annatto and it’s a good rule of thumb to avoid that additive whenever possible. My simple work around for making string cheese: Cut off chunks from the brick. Having sliced cheese on hand is a HUGE time saver, I admit, but it’s definitely not worth the cost! Organic shredded cheese runs an average of $6.99/lb – nearly $1.50 MORE per pound than the brick. Considering you can shred an entire 2 lb brick of cheese in just a few minutes, I say save the cash and use those muscles. Plus you can shred however fine or thick, short or long as you want, instead of being at the mercy of what’s available on the shelf. So those are the price points summed up, and clearly, the brick cheese wins out. What’s even better though is that buying bricks of cheese means you can avoid the additives that come with shredded cheese (powdered cellulose in particular, which helps to keep the cheese from sticking to itself). You can also try new flavors that aren’t offered is slices or shred, and it’s much easier to find grass-fed cheese in bricks than in other forms. When you bring home a brick of cheese that is larger than what you can eat in a couple of weeks, go ahead and shred/slice/chop what you need. Then measure and portion the cheese into individual freezer-safe containers. When you need cheese for a meal, simply pull one out to thaw for dinner. Note that the texture of once-frozen cheese is slightly different than fresh, so I would not recommend this if your cheese is intended for snacking. Go ahead and stock up if you come across a great deal on grass-fed cheese. Even more so if it’s a “general” flavor like mozzarella, mild cheddar or Monterey jack. Follow rule #1 above and you’ll be set for quite some time! The easiest way to spend a lot of money on cheese is to only buy one particular kind. Try swapping similar flavors, based on what’s available and the prices, to keep the cost of cheese down. All of these cheeses can be used interchangeably without drastically effecting the flavor (or possible not even effecting the flavor at all). 4. Slice your pieces thinly. When you’re adding sliced cheese to sandwiches, it doesn’t take much to do the trick. Slice thin pieces instead of thick and you’ll make your brick last longer. 5. Always buy Parmesan (or Pecorino) in bricks or wedges. It seems silly to add since I’ve already convinced you that buying cheese in bricks is the way to go, but this holds especially true with Parmesan. This cheese has a very strong and distinct taste, so it doesn’t take much at all to enhance dinner. When you manually shred it yourself, you can better control how much you’re using and the flavor. Plus it’s one of the more expensive cheeses, so pulling some out of a container or even pouring some out usually means adding more than you need and going through what you have much more quickly. 6. Shop the dairy case over the specialty section. Buying cheese at the supermarket? Brands in the dairy case can be up to 45 percent cheaper than those in the specialty food section. As with any rule when shopping, read the label to make sure there isn’t any icky stuff added. 7. Shop gourmet stores for gourmet cheese. It might sound contradictory to shop at a tiny mom and pop shop over a bigger store, but in most cases, you’ll spend less on gourmet cheese at a cheese shop than you will on gourmet cheese at a traditional supermarket. Remember that markets have to order a lot and sell a lot in order to make a profit. The cheese stores will sell as little as 1/8 lb, or just 2 ounces – and then you’re only paying for what you really need. Brand names don’t matter a whole lot in cheese – it’s the ingredients that you should be looking out for. Read up on the 30 most common dairy additives if you haven’t already, and aim for cheese that has just milk, enzymes, salt and rennet (optional). Do you have any tips to share with us? 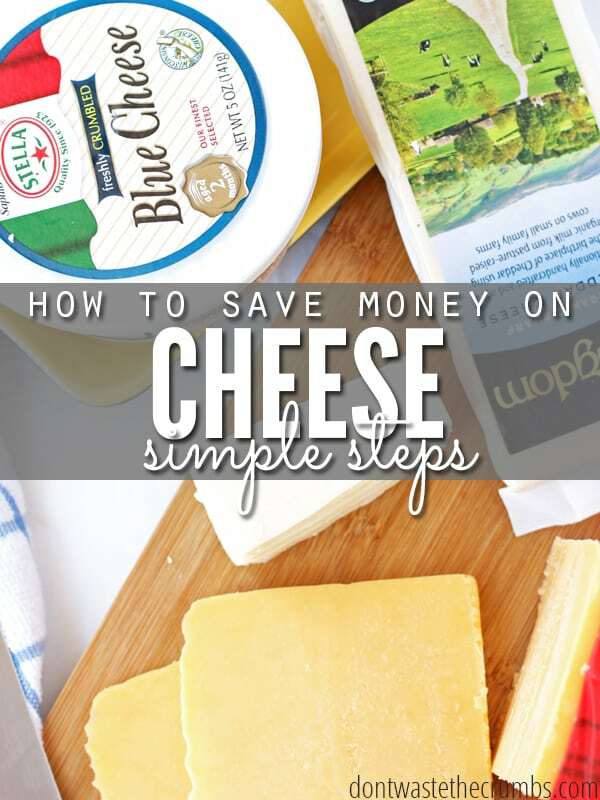 How do you save on cheese? OK! Ready for my take on things? 😉 I have always heard the brick is cheaper but that’s just not the case any time I have done the math, especially between brick and shredded of the same brand. Granted I only buy conventional, but if the grocery store has a sale on store brand cheese, the brick and shred are the same price per oz. At sam’s I checked and the 5 lb block of mozzarella was cheaper than pre shredded so I figured I would try it. I did it with my food processorand it was no fun! I hear now I should cut in chunks and get them slightly frozen before running them through. Anyway, I froze them in 8 oz bags since we commonly use that for making pizza. However they are all stuck together and I can’t sprinkle it the way I want, only in clumps. Way too much frustration for me to ever do it again. Thankfully the shredded cheddar is cheaper than the block 😉 and I know it has cellulose but its not a step I am going to take right now. BTW, your link to the dairy additive post is missing. LOL, thank you for sharing Helen! And for the tip on the additive – fixed. I appreciate hearing your point of view!! I think that must vary by location or something, because I don’t remember that being the case when I was newly-married. What I usually do with my shredded cheese is store half of it in a big container in the freezer and the other half in another container in the fridge to have it ready for me to use (the timeset for me is considering how often I will use in such period of time). You can always adjust the amounts that suit you best! That has done wonders for me and has remived so much hazel! Also, when you’re about finished with your fridge-stored cheese, just transfer the other contair from your freezer to the fridge and allow it to unfreeze overnight or a good 8hrs. I haven’t actually done any measuring and comparing, but my husband is sure that we use less cheese when we shred it using the small holes on the grater rather than the large ones! Because the shreds are thinner the grated pile is fluffier therefore the pile looks larger even though you actually grated less cheese. We do this when grating cheese for tacos or using it as an add-on topping for soup or beans at the table. Excellent ideas! This is kind of like your swap flavors idea, but have you ever used sharp cheddar in the place of regular? Because it’s “stronger” you can often get by with less and still have the same flavor! I have not because I don’t think my Costco carries organic sharp cheddar. I’ll have to check next time. If they do, it’ll likely be $1 more, but per your advice, it might be worth that extra dollar! I periodically check the prices of shredded, but it seems so obvious that block is cheaper. And since I’ve never bought shredded, I guess I have no idea how much more time it takes to shred. When I need to shred a lot of cheese, like on pizza nights, I just use the grating blade on my food processor and it takes almost no time at all. Between this post and the dairy additives post, you might have convinced me to upgrade my cheese. Just even conventional cheese is so expensive, and we don’t have Costco–the price you quoted is about what conventional cheese sells for! But almost all the other animal products we buy are high quality; I’m sure we could trim somewhere to upgrade cheese, too. I hadn’t done the math on buying blocks vs shredded, so thanks for this! And I’ve read that “powdered cellulose” can include wood chips. Yum! Wow, I wish there was a Costco where I live. Organic cheese starts at $11 a pound at local grocery stores, if they even have it. Hi Tiffany – great suggestions. I have been buying the large blocks of cheese ever since I first saw them available. The price-per-pound has always been better overall, and even when shredded and sliced was buy-1-get-a-million free, I didn’t like the additives used to keep them separated and from getting clumped back together. I do get some cheese from Costco, but that is only when I cannot order from a wonderful company in Ohio called Minerva Dairy. Minerva has the best prices as long as we buy in bulk and by cases and stick to what’s on sale for the month. I get together with my cheesy friends in a cheese co-op that I do out of my home. Minerva is not USDA organic graded, but they are a small company that uses milk from local sources usually grass-fed. Their Amish butter is so delicious, we could slice and eat it like cheese. Their habanero pepper Jack is the best in the world as is their Smoked Gouda and Baby Swiss. They offer some raw cheeses too like goat milk and sharp cheddar, but they are a bit out of my price range. Our order is delivered via UPS and is packed in coolers with freezer packs. So thankful to Minerva that we can enjoy such deliciousness at affordable prices. Thank you! I’m in Ohio and have been looking for a good source of dairy. I’ ve seen lots of people take the store brand block of cheese at the regular grocery store (Winco) and bring it to the deli dept. They ask to have it sliced. I’ve never done it and wonder if it costs anything. The deli will typically slice cheese for free. The butcher will also cut up chicken and roasts or grind meat for you. It typically does not cost anything to have the deli slice your cheese (or for the butcher to cut your meat). I sometimes buy grass fed cheese in 5 lb blocks when we visit family in Ohio and freeze it in 1 lb. chunks before bringing it home in a cooler. I don’t think the texture is noticeably different unless it has been in the freezer for more than a month or so. We are eating some sharp Swiss that has been frozen for quite a while and it is crumbly, but the cheddar is usually fine even for just snacking for quite a while. I usually just cut mine with a knife though, a cheese cutter seems like one of those single job kitchen tools that I don’t need any more of! I have never bought sliced cheese unless we were on the road so I am not totally sure about this, but doesn’t a block stay fresh longer? I think a block of cheese does stay fresher longer than pre-bought slices. We typically cut with a knife too, and often shred the entire block then portion and freeze individually so we don’t have to deal with the crumbly stuff later. Now to find a good source for a block of grass-fed cheese! Cheese is must in our home! I do use the calculator to help me break it down. What I found was this….at Sam’s Club (I have a membership) there are packages of sliced cheese. They are sold in 2lb packs. You can get 36 to 24 slices (it depends on the kind and cut) for about $9.78 a pack. That is about $4.89 a lb. There a store called Winco in my area. The same sliced cheese is $3.49- $3.89 a lb. It come in smaller packs. I don’t care thou. I just get to pick other different kinds of cheese in a smaller packs. Provelone and Swiss are a few of favorites. At Sam’s club the 5 lb block is much cheaper there. It is 11.89 so that is $2.37 a lb. Can’t beat that!! So that is my cheese deal break down! I’d suggest chopping the 5lbs down to 1lb increments and freezing that way karen. Or slicing, shredding first, then freezing! I love cheeses so I really don’t pay attention to prices but not after reading your tips. I love tip #7. Yes, why bot gourmet stores for savings on gourmet cheeses. Quite a tip. I’m curious about your waning about annatto. It’s plant based, often used in Hispanic recipes, used to treat several problems and except for slightly raising blood sugar, seems benign. What am I missing? Hi Sandy! Although it’s derived from natural sources, it’s been linked with causing behavior issues in kids as well as irritable bowel syndrome. Thanks. I hadn’t heard that. Spread shredded cheese on cookie sheets lined with wax or freezer paper – place in freezer until cheese is hard – then transfer to ziplock bags for longer storage. Great tip Jaime! I do that with fruit, but hadn’t thought about doing it with cheese! Oh, and a microplane grater is a great option to have on hand for quickly grating wedges of Parmesan, Romano, etc. The fine grate makes it easier to melt the cheeses into sauces. Nevermind the cost factor- shredding cheese at home tastes so much better. Plus the powder to keep pre-shredded cheese from sticking together is kind of nasty. If I know I’ll be busy during the week, I’ll shred most of the block at once, leave a little for slices and cube the remaining 1/4 or so to snack on with slices of apple. Divided up Cheddar Cheese that I sliced, stuck 4 lbs in the freezer in 1lb vacuum sealed bags and put another sliced lb in the fridge for use. When I took the frozen bag out a month later and let it thaw, it was like it was fresh from the deli. Not crumbly at all. Nice!! Thanks for sharing this with us Brian!